Folder Protect adalah sebuah konsep baru dalam Keamanan Data. Aplikasi Ini memungkinkan Anda melindungi dengan password pada folder, file, drive, program/aplikasi yang diinstal ,ekstensi dan yang Utama memungkinkan Anda menetapkan hak akses yang berbeda. FolderProtect dapat melakukan penguncian file secara normal dan enkripsi sehingga membuat file tidak dapat diakses, tersembunyi, menghapus-bukti atau tidak dapat diedit. Program ini menggunakan tingkat perlindungan Windows Kernel yang bahkan dapat bekerja di Safe Mode sehingga menjamin keamanan tingkat tinggi dari folder yang dilindungi sandi. Anda dapat mengunci, menyembunyikan, memblok akses dan bahkan mencegah data tidak dihapus atau dimodifikasi. Hal ini dapat membantu Anda memberikan akses data Anda kepada orang lain tanpa khawatir File anda akan dilihat,dihapus atau dimodifikasi. 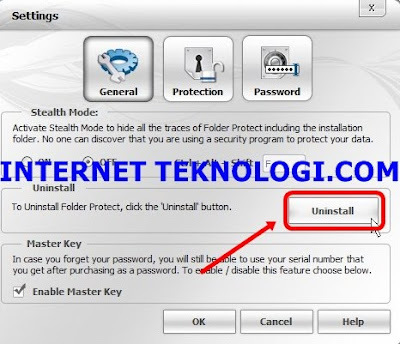 FolderProtect tidak dapat diUninstall tanpa password yang benar. Selain itu, Anda dapat mengatur kapan waktu File data atau Folder anda akan dilindungi secara otomatis. This Version update improves Safe Mode Protection functionality as well as enhances compatibility with all variants of windows 7. Data in Use Protection: Folder Protect is a pioneer in ‘Data in Use’ Protection. Unlike other file locking programs, Folder Protect can help you password protect your files, folders, drives and programs using access levels and flags such as ‘No Access’, ‘No Visible’, ‘No Delete’ and ‘No Write’. Customized Security: Customize your data security with a mix of unique access levels for certain files and folders. You can choose to make files inaccessible; accessible but write-protected and / or delete proof; and / or hidden from other users. You can also simply right-click a file to protect/unprotect it. Protect from Viruses: Viruses, spyware, bots, dialers and all types of injections will be blocked from accessing your protected data. Choose ‘No Access’ flag and the program will be protected from malicious third-party software as well. Block Access: Set the program to deny access to protect files completely. You can let the blocked items hidden or visible depending upon your preference. No one can access your data without your permission or password. Hide your Data: Hide your confidential information from snoopers and spyware. This is not a normal Windows attribute setting that can be very easily breached. It’s an advanced level of kernel level hiding that keeps your data hidden irrespective how anxiously someone tries to fiddle with it. Write Protect your Data: Use of ‘No Write’ protection flag blocks your files from being modified, edited or altered. Your files remain accessible and readable to other users but can’t be modified in anyway or form. Make your Data Delete Proof: You can prevent your data from being lost, stolen or deleted. Your files remain accessible yet delete proof. Protection in Safe Mode: Folder Protect boasts a feature not offered in any file locking programs before. If activated, the protected items remain protected in Safe Mode as well. You can also protect/unprotect items by running the program in Safe Mode. Masking Protection: Save your time by protecting your desired format of file with Folder Protect. 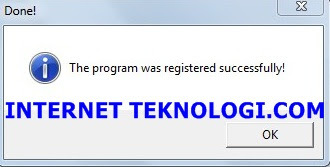 The program protects system wide extension like *.avi, *.gif, *.jpeg, *.bmp, *.mp3, *.wmv, *.mpeg, *.doc, *.mpg, *.jpg, *.pdf, *.psd, *.ai, *.flv, *.xls, *.wma, *.docx, *.ppt, *.pptx, *.htm, *.html, *.php, *.css, *.cpp, *.asp and *.js. Auto Protection: Activate auto protection and set an idle time you wish for the program to automatically protect your listed items. Feature is useful if you let yourself away from your PC for a fair amount of time and don’t want to risk data theft behind your back. Stealth Mode: Activate Stealth Mode to hide all evidences of Folder Protect been installed on your Computer. Use your own hotkey to run the program in total stealth. Accessibility: Folder Protect lets you choose the behavior of the program if someone tries to access protected items. You can set it to either prompt you to enter password or deny access. Compact Design: Folder Protect is a small, compact and user-friendly interface. It takes only 2MB of hard disk space and looks like a fundamental part of your operating system. Disitusnya Folder Protect v1.9.1 Terbaru Full Version dihargai seharga USD 39.95,Tapi Di InternetTeknologi.Com anda akan mendapatkan secara Gratis. Jika anda pernah menginstall Folder Protect versi sebelumnya dan Full Version,anda cukup menguninstall,lalu Install versi terbaru ,maka versi Terbaru langsung Full Version. Install File bernama folder-protect sampai selesai,jika sudah selesai keluar dulu. Tunggu sebentar sampai muncul pesan sukses. 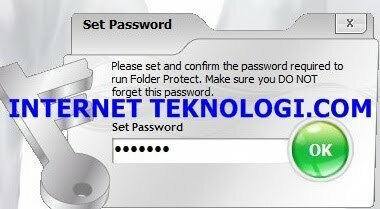 Ketik Password untuk membuka software Folder Protect , INGAT ! 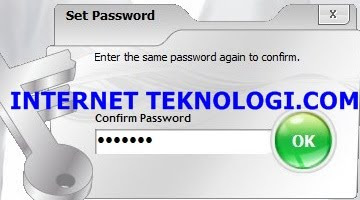 !anda harus ingat password ini karna ini merupakan Password akses utama Folder Protect. Ketik sekali lagi, Klik OK.
Tandai semua No Access (tidak bisa diakses/Not Permission),No Visible ( untuk menyembunyikan),No Delete (agar tidak bisa dihapus) ,No Write (agar tidak bisa diedit). Software ini walaupun ukurannya kecil tapi Fungsinya sangat Powerfull , anda juga bisa Cukup klik kanan pada folder yang ingin diprotect, lalu pilih Folder Protect>>Protect. 3 orang berkomentar on "Download Folder Protect versi 1.9.1 Terbaru Full Version Rilisan 21 Juni 2011"